As we love and care for each and every one of the children here at Umbrella, we are always happy to see a child reintegrated back with their family. A number of our children here have been separated from their families during the 10 year civil war and thanks to our dedicated staff traveling the countryside we have been able to reconnect many of them. We reunited 6 children with their families this month and will continue to stay in contact and monitor their progress. We are very happy with our dedicated field officer Tsewang Norbu who just came back from a successful 3 week trip visiting many of these families. He worked tirelessly often walking for days to these isolated villages, with pictures and profiles of the children from the district. Tsewang also brings letters and drawings from the children to give to the families and relatives. 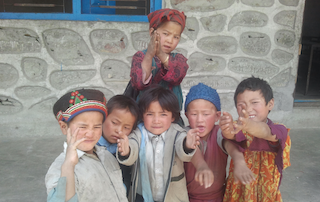 The children are always delighted to receive pictures and news from their villages when he returns. Reuintegration is not an easy process – there are lots of things to consider before it is attempted and so a lot of work goes into every case to make sure that we have done everything in our power to ensure successful, happy and safe cases.